During the Factory Grade® commissioning of a new cable system at a critical generation facility, substandard partial discharge (PD) activity (per ICEA S94-649) was observed at numerous points in a few cable systems. The client employ IMCORP's location matching services, pinpointed the defect locations and samples were extracted for root cause analysis at the IMCORP laboratory in Manchester, CT. 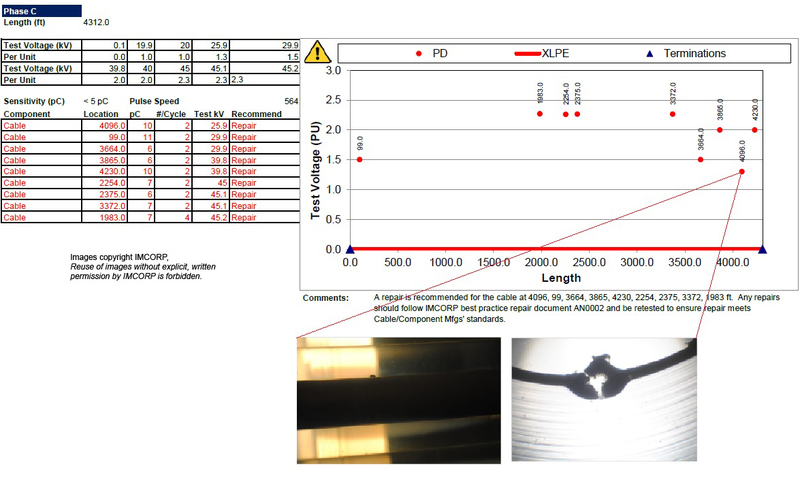 The cable sample was reassessed in the lab and found to exhibit the same sub-standard PD activity identified in the field. To identify the issue causing the PD activity, about 30 cm (1 foot) piece of cable was dissected and put through hot oil and a wafer analysis. A conductor shield protrusion was observed (see accompanying pictures above) at the location where the field assessment had originally identified the PD activity. The defect in the insulation occurred during the cable manufacturing process. Factory Grade® assessment of the cable system during site commissioning likely saved the client from multiple costly cable system failures.